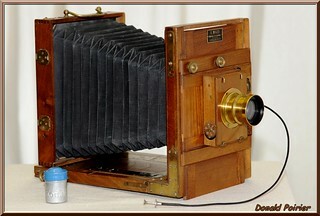 E. Mazo (Elie Xavier Mazo) was a camera maker in Paris, around the turn of the 20th century. The company was located at 8 Boulevard de Magenta, close to the Place de la Répubique in the 10th arondissement. Mazo filed a number of patents, mostly in relation to the design of projectors. Most of these were in partnership with Auguste Jean-Baptiste Tauleigne, a parish priest in Poligny, about 180 km south-east of Paris. A few of Tauleigne's patents from the 1920s were filed jointly with Mazo's son Gaston. ↑ Mazo Reisekamera approx. 17x17cm with 210mm Mazo Anastigmat and front roller shutter, sold at auction by LP Foto in June 2008. The maker's plate gives the company address as Blvd St Martin, not far from Blvd de Magenta. This page was last edited on 20 February 2018, at 06:13.